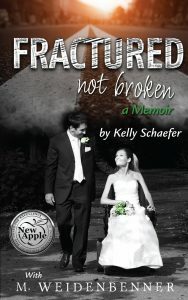 Fractured Not Broken is a true story of loss, faith, and a rare love that only happens in nonfiction. In a sweeping narrative and heart-wrenching story, Kelly exposes the truth about what happened after a drunk driver rendered her a quadriplegic. She shares how she found her way back—through faith and pain, her community, her family, and the love of a man she’d prayed for.